EngagingPatients.org Sherman Award Recognizes Innovation in Patient Engagement - Welcome to EngagingPatients.org! The Sherman Award for Excellence in Patient Engagement recognizes innovative programs that focus on building stronger engagement through deeper, more meaningful communication and relationships with patients and families. The award is conferred annually by Taylor Healthcare and the National Patient Safety Foundation’s Lucian Leape Institute on behalf of EngagingPatients.org. The winners and finalists were announced for 2017 at the annual Patient Safety Congress held by the National Patient Safety Foundation in Orlando in May. Their stories are told briefly below and in longer stories posted this month and next on the Engaging Patients blog. It’s never too early to think about colleagues, organizations, and your own work in the context of patient engagement and the Sherman Award. Whose work would you like to recognize and offer as an example and lesson for other healthcare organizations? Nominations for next year’s Sherman Award will open early next spring. University of Rochester Medical Center | Rochester, NY UR Voice Team | Data makes a difference. UR Voice, uses an NIH-funded software program called PROMIS (Patient-Reported Outcomes Measurement System) to capture patient perspectives on care. Patients take a 3-5 minute iPad survey at every outpatient visit. PROMIS captures patient perspectives on important indicators including physical function, pain and mood level. The data is used for shared decision-making—especially evaluating whether a treatment or surgery is a good choice based on the level of impairment or pain. It allows patients to compare their data with US normative data and shows graphically what the treatment should do for them before they start using predictive analytics. The team included patients in the project pilot and made changes to the program based on their input. The survey tool is being used by 550 physicians in 30 clinical programs and to date, more than 350,000 surveys have been completed by more than 112,000 patients. What Our Judges Said: Judges were impressed by the use of the data to facilitate patient conversations and enable shared decision-making. “It (the program) empowers the patient to know what they are signing up for with surgery/physical therapy,” said one judge. Holland Bloorview Kids Rehabilitation Hospital | Toronto, Ontario Client & Family Centered Care Simulation Development Team | Show, don’t tell for powerful results. What Our Judges Said: The integration of patients and families into the entire process and serving as simulation facilitators resonated with our judges. They were impressed that patients and families are being asked how they prefer to communicate and receive in- formation and that these simulations are focused on improving that communication and building relationships between providers and patients. Brigham and Women’s Hospital | Boston, MA Patient Safety Team | Transparency matters. Brigham and Women’s Hospital launched “Safety Matters,” a monthly online publication where the hospital shares the stories of mistakes they have made, what they have learned and system improvements as a result of the mistakes. The publication, at www.BWHSafetyMatters.org, shares inspirational stories that transform how patients and providers communicate about safety concerns, urging patient collaboration with staff in improving quality of care. It covers a range of topics from medication errors to procedural errors and tips for patients can advocate for themselves. 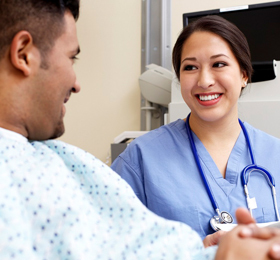 Patients are involved in the interview and review process as are clinicians and staff. Privacy of ce staff review stories to protect patient privacy and readers can interact by posting questions and comments online. In 2016, there were more than 21,000 public views of the website. What Our Judges Said: Our judges remarked on the courage it takes to share this information publicly and encouraged other organizations to take on the challenge of being equally transparent. Family Resource Connection | Look beyond hospital walls—Where kids play, learn and grow! The Dayton Children’s Family Resource Connection uses a child’s visit to the doctor as an opportunity to address non-medical issues that have an impact on health. Research shows that families have difficulty addressing health issues when basic social needs are not met. Dayton Children’s Family Resource Connection uses a strong cross-disciplinary student workforce that partners with the hospital’s social work department and primary care providers to screen families for social needs during their appointments. This information is used to connect patients and families to much needed resources. During the first six months of the program, more than 1,500 families were screened and 600 families were enrolled resulting in more than 300 connections. What Our Judges Said: Judges found the program inspirational and innovative and appreciated the complexity of dealing with vulnerable populations. They were impressed by the use of students—which allows for clinical staff to practice at the top of their licenses and by the relationship created between the hospital and families as a result of the connection to resources. Health Professions Affinity Community (HPAC) | Citizenship health works. Northeast Ohio Medical University (NEOMED) has developed the Health Professions Af nity Community (HPAC) program to reduce the health professions shortage, while addressing the health needs of the com- munity. The HPAC program has grown from a small pilot program in Cleveland, Ohio to one of the largest pipeline programs in the country, serving approximately 2,400 high school and college students across the state of Ohio. HPAC empowers youth to become agents for community change. Students self-identify a community health issue and partner with Americorps workers to devise a plan to address the issue. The results? Increasing numbers of students interested in healthcare careers, improved college readiness, development of leadership skills, increased community engagement and healthier communities. Students in HPAC enact more than 200 grassroots community health improvement projects annually across Ohio and engage an estimated 15,000-20,000 Ohioans in their work. What Our Judges Said: Our judges praised the way HPACs engaged students to bolster interest in health- care careers and were impressed with the grassroots work to make a difference in the health of the stu- dents’ respective communities.